For ither uises, see Cali (disambiguation). Location o the municipality an ceety o Cali in the Valle del Cauca Depairtment. 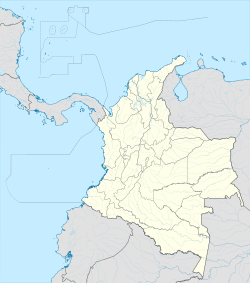 Santiago de Cali (Spaingie pronunciation: [sanˈtjaɣo ðe ˈkali]), simply referred tae as Cali, is a ceety in wastren Colombie an the caipital o the Valle del Cauca Depairtment. Wi a population o 2.5 million, Cali is the third lairgest ceety in the kintra, efter Bogotá an Medellín. It haes ane o the fastest growin economies an infrastructur in the kintra acause o its geographical location. The ceety wis foondit on 25 Julie 1536 bi the Spainyie conquistador Sebastián de Belalcázar. The ceety haes a compoond name in the fashion o amaist aw Spainyie settlements in Americae. Santiago (ane o the maist popular names on the continent thanks tae the devotion o Santiago de Compostela in Spain), lives up tae the Apostle Santiago. Cali wis foondit 25 Julie, the day which marks the date o the Apostle Santiago, principal patron o Europe. Sae gien this name tae the ceety. Cali, derivit frae the wird o the Páez leid, Caly (Knittin). Lik mony ithers placements o the depairtment. Ej: Buga (Large clay pot), Yumbo (Flood, river bank, lairge river. ), Sonso (Frog), Dagua (A teep o tree), Petecué (Macaw), Tulua (Orchad), Chipichape (Ceukit corn kernels), Yotoco (fans the flame), Quilichao (Flame sheds), Changos (Chisel). Santiago de Cali is ane o the auldest ceeties in Colombie, an the Americas. Its foundation dates back tae 1536 bi the conquistador Sebastian de Belalcazar (ane o the indigenous genocide o the time), tae juist three years efter the foondation o Cartagena de Indias (1533), twa years afore the foondation o Santa Fe de Bogotá (1538) an 26 years o the foondin o the first Hispanic population on the continent: Santa María la Antigua del Darién (1510), missin.